In your favorite browser, go to the Gamestar Mechanic home page. Click the orange Get Started button on the right side of the screen. As long as you aren’t logged in as someone else, clicking this button takes you to the Step 1 page for becoming a mechanic. In the Username text box, enter the name that you want to appear on your games, reviews, and comments. It can be a simple name, such as Isometrus, or a more technical name, such as GamingMasterJC109. Make sure your username properly reflects yourself. Also try to avoid egocentric names such as Best_Designer_In_World_999. In the Password text box, enter your preferred password. Create a strong password. Try using numbers and other non-letter symbols that are difficult to guess. Also you might choose words and abbreviations that are meaningful only to you so that you can remember your password easily. Most importantly, never give your password to anyone, including people claiming to be Gamestar Mechanic administrators (the real administrators will never ask for your password). Confirm your password by entering it again in the Confirm Password text box. This step checks for typos. Select your birthdate from the Month, Day, and Year drop-down lists. Because the program is intended for all ages, certain age-restricted features that are supported by the site have to know the user’s exact age. Scroll down to the text that reads I have read and agree to the Gamestar Mechanic Terms of Serviceand click the Gamestar Mechanic Terms of Service link. When you@’re finished reading this document, return to the previous page. This online document outlines the rules of the website. Select the check box to confirm that you have read, and agree to, this document. Click the large orange Register button. You’re asked some multiple-choice questions about topics such as your favorite animal, school subject, and color. The site asks you these questions twice, to confirm that you remember them, and again if you want to recover your password. Write down and save your answers in case your preferences change. Start your free adventure with the Addison Joins the League quest. Buy a premium account ($19.95) that includes lifetime access to Addison’s Complete Quest, including Addison Joins the Rogue and Dungeon of the Rogue. Enroll in an online learning course ($249), where you learn how to design games from professional designers. For now, you can start with the free version. Click the orange Get Started button to start poking around. When you first create your account, you are automatically logged in. If you want to log in to the site in the future, go to the home page and click the orange Log In button, which appears under the larger Get Started button. The login page opens, where you enter your username and password in the appropriate text boxes and click the Play Now button to access the site. If you’re logging in from your own computer (rather than a shared computer), or if you visit the Gamestar Mechanic website often, select the Remember My User Name check box. This action automatically fills in your username when you log in, enabling you to more quickly enter the site. If you’re inactive for too long (about an hour), then your session will expire. 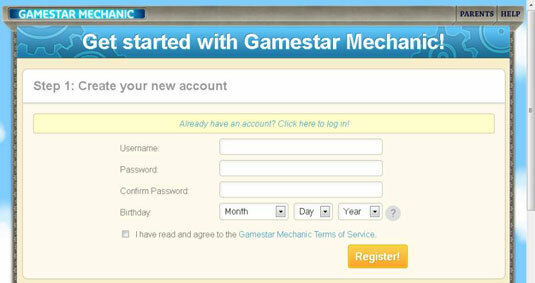 If you try to load a new page or level, Gamestar Mechanic will prompt you to log in again. Don’t worry about losing your progress; if you were in the middle of playing or designing, the login screen appears on the game screen, and you can return as soon as you enter your username and password.